◆ High-performance floating-point DSP processing chip. 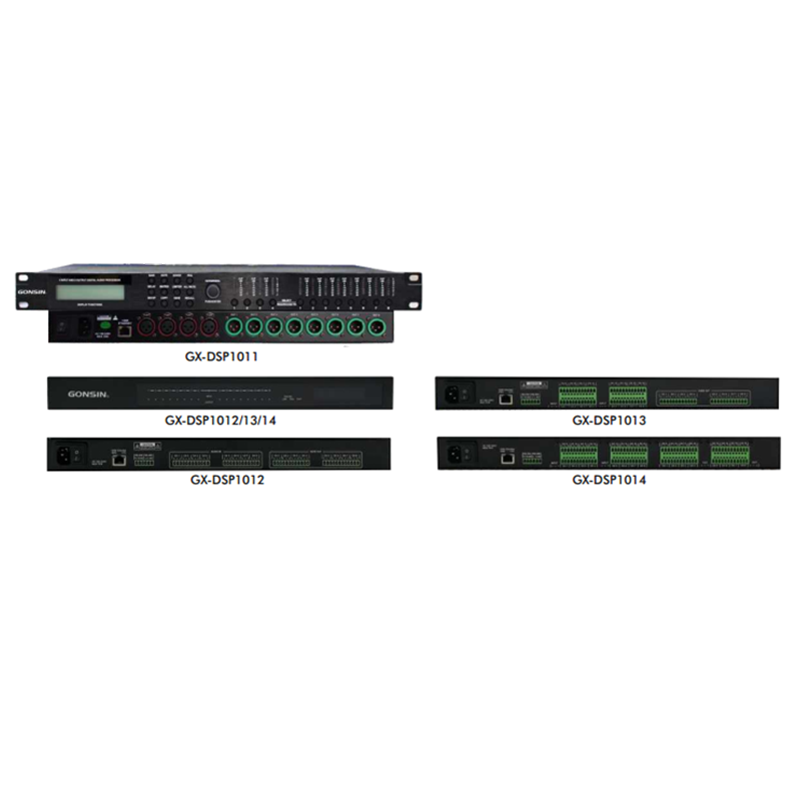 ◆ All the input channels support MIC input,with 48V phantom power soft switching ( for GXDSP1012/13/14 only ). ◆ All the input channels are with Gain Control, Noise Gate, Automatic Feedback Suppressor, High and Low Pass Filter, Parameter Equalizer (16 segments), Compressor, Delay Timer and Input Marshalling Controller. ◆ All the input channels are with High and Low Pass Filter, Parameter Equalizer (16 segments), Compressor, Delay Timer and Input Marshalling Controller. ◆ Built-in signal generator: sine wave signal, pink noise, white noise. ◆ The front panel carries with input and output volume display lights, error warning light. ◆ The panel carries with LCD display monitor, helps display the system status directly. ◆ Be open to RS-232(for GX-DSP1012/13/14 only)and TCP/IP, the third-part calling-control could be achievable. ◆ Enables to output camera tracking code, be conducive to realize camera linkage function through the third-part calling-control. ◆ Preset-scene function that is supportive to 32 sets scenes, can be adjusted by RS-232(for GX-DSP1012/13/14 only)and TCP/IP. ◆ Optional function: AEC (for GX-DSP1012/13/14 only). ◆ Can take control through Ethernet, the operation interface is visualized and the setting is easy and efficient. sine wave signal, pink noise, white noise.